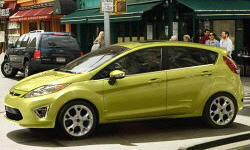 Ford Fiesta Powertrain Performance Pros and Cons | Page 1 of 1 | Why Not This Car? Best choice at the time. 6-speed automatic transmission. True fuel injection, variable cam timming engine. Quick accelleration, maintains highway speeds and passes cars on highway with incredible ease. I do not feel like the proverbial 98-pound-weakling driving this car on the highway!